We did it, everyone! We survived Monday. I know it was hard. And I know you probably looked at the clock more times than you'd care to admit. But it's Tuesday, a VERY good Tuesday if you're in New Orleans, but even if you're not, we're still closer to Friday! Woot! This is Part 2 of my Valentine's Day nail art series and I think this may be the simplest of them all, but it has just as much impact. This requires a little more attention to detail than Part 1, and a bit more dexterity, but I have faith that you can do it. 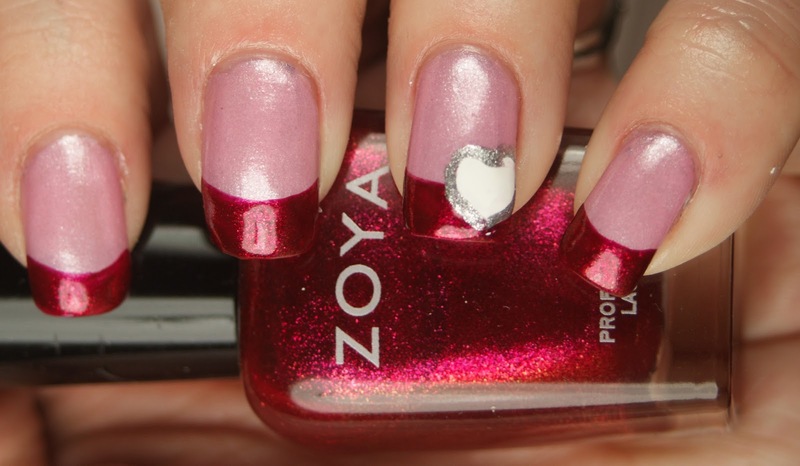 For my Valentine's Day French, I used Zoya Gei Gei (from the new Lovely Collection) and my favorite Zoya of all-time, Zoya Sarah! I also used Purity and Trixie to get the heart shape with nail art brushes. The heart was a little bigger than I intended, but I didn't mind it at the end. If you can't draw a heart freehand (I'm not counting myself amongst those who can), you can always use a decal or even a stamper. I freehanded the French tip. Don't feel bad if you can't... honestly, I finally got the hang of it last year after failing miserably for... oh... seven years. But if you can't freehand it, there is no shame in that. You can use striping tape or even regular old scotch tape for a guide. If you use scotch tape, just make sure that the base color is completely dry and you stick each piece to your palm once so it won't pull off any polish! I always loved doing non-traditional French manicure colors, so I wore this all weekend. What colors would you use for a Valentine's Day French?